In just one week Gaby starts kindergarten at Baulkham Hills North Public School. Sorry Camila, but you’ve been bumped from the top story. 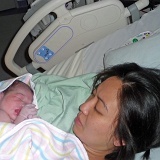 Tayin and Joevin Atienza have a new baby, Julio Miguel Iñigo-Atienza. Some more photos of beautiful Camila at the age of four days. Kriscia and Camila decided that although Westmead Hospital was a great place to give birth, the food was not as good as home.